The world of communications and marketing has embraced the era of content marketing with open arms. Content marketing is perhaps most often understood, and if you believe Google’s definition, in Pic 1, as being online content that isn’t direct sell, but rather tries to lead the audience to view the brand in question favourably. In other words, not trying to force the proverbial horse to drink, but gently direct it towards the water. Yet, many of us have had painful encounters with content designed for the purpose. The development or adjustment of content strategy (72% of respondents). Why then is an encounter with content marketing so often such an unpleasant experience? 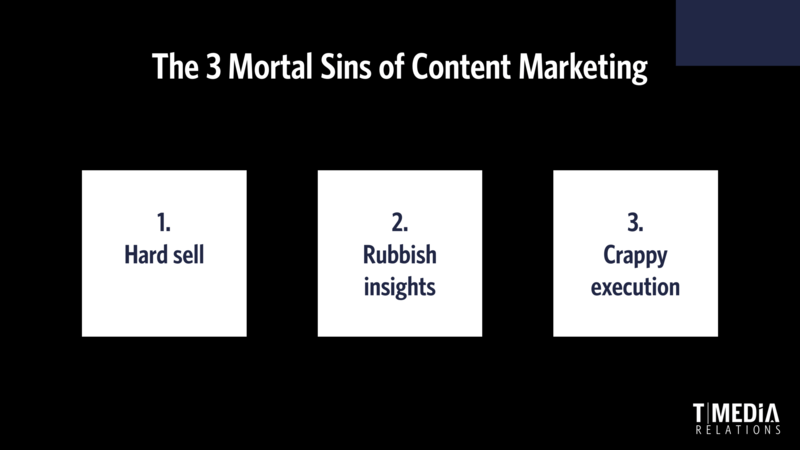 Pic 2 lays out the mortal sins of content marketing. They are hard sell (“We opened a new petrol station you CAN’T LIVE WITHOUT!”), rubbish insights (“In buying IT services, it is important to have an IT strategy.”) and crappy execution (“Our exprets have great expertise, book your time slot for a call with our phone help now!”). The underlying cause for bad content marketing, which manifests itself in the three mortal sins, is that its focus isn’t in actually trying to help the customer – whose eventual question in any commercial engagement will be, what’s in it for me? Changing one’s attitude to content marketing is the first step in getting better at it. This first step should lead to the elimination of the three mortal sins. There’s a lot more to the topic. I will be returning with more tips in later posts. Stay tuned. Meanwhile, if you have questions, or just want to chat, please drop me a line, or give me a call. And thanks if you got this far!